Radziszewski asks a group of volunteers, chosen outside the art world, to perform a re-enactment of physical actions loosely inspired by those practised by Jerzy Grotowski’s actors: instinctive actions with no score, based on improvisation, similarly to what the actors appearing in Radziszewski’s The Prince film were asked to do. Such circularity represents the full potential of Radziszewski’s archivistic approach. 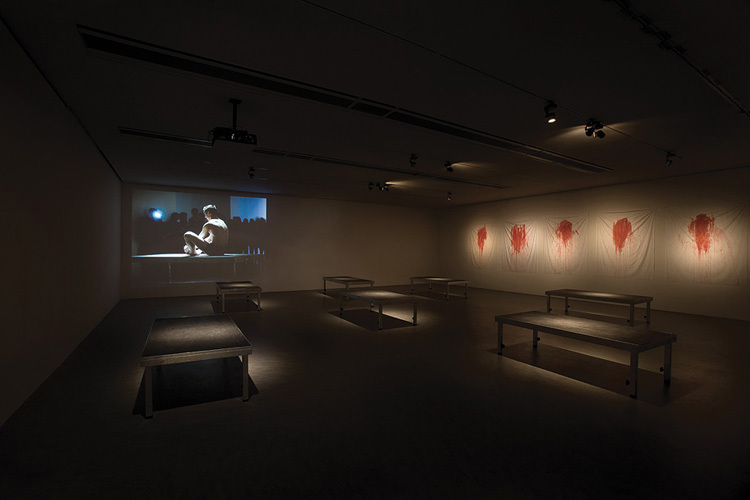 It activates a short circuit between the dimension of documentary reconstruction represented by the archival materials in the show; the dimension of fiction present in the film The Prince and the ostentatious stage fetishes; the performative dimension that during the opening allowed the observers to re-enter the flow of the event in an intertextual manner, into its here and now. The documentary dimension evoked by silent pedestals, residual traces of actions now finished, in turn evoked by the projection of images of re-enactments that are no longer perceived immediately, but in a kaleidoscope of spatiotemporal referents simultaneously deployed and interconnected.